Mark Combs Author » Blog Archive » REMEMBER THIS TITAN? 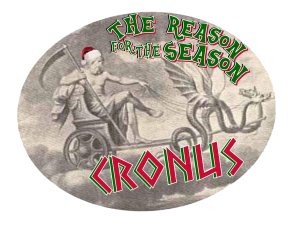 Cronus (not to be confused with Chronos with an “H”) was recognized as God of the Harvest and always pictured with a Scythe. Chronos with an “H” is not one of the Gods, but rather the Greek personification of time and origin to the personage: Father Time. Perhaps the confusion of the two through the ages resulted in the modern day Father Time being pictured with an hourglass (accurate) and sickle (misplaced). We’ll get to him in a couple weeks. The Saturnilia Festival was wildly popular throughout the Roman Empire and is thought by some to be the origin of many traditions that have become a part of our modern-day celebration of Christmas. In the Middle Ages, the Catholic Church banned the giving of gifts, citing the pagan origins of the celebration. They had sound reasoning, validated by plenty of historical tradition. The giving of gifts and celebration was once again approved by the church years later. The new tradition was associated with the generosities of Saint Nicholas and the Biblical record of the Magi bringing gifts to Christ. We celebrate our modern traditions with the church’s blessing (all denominations). Before this goes completely off the rails and I’m accused of being anti-Christmas, let me assure you that my wife and I enjoy the season and most of the things that go with it. 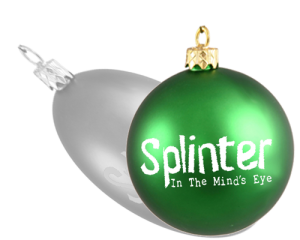 I… we, just don’t associate it exclusively and militantly with the birth of Christ, as He actually isn’t “The Reason for the Season.” Truth be known, and it sort of is at this point, the incarnation of Deity doesn’t lend itself to this spot on the calendar at all. Historical research points more logically to mid-September date in 3 BC. As I said, my wife and I enjoy the season. We send gifts to a few friends who have impacted our lives throughout the year and we are always pleased to see that someone was thoughtful enough to send us a personalized card. We have our own tree, a small, live Norfolk Pine that we have enjoyed for 3 years now and bring into the house after Thanksgiving. I hope this doesn’t horrify anyone, but my wife even decorates it each year and this year it has grown enough to graduate to larger bulbs. The exchange of gifts is always an exciting time and I’m sure we all have fantastic stories of gifts given and gifts received; but it has always been my belief that the greatest gifts were never attached to a price tag, nor wrapped with a bow and brightly colored paper. My mother gave me the Gift of Life. Yes, I consider that a gift. I was born to her in her later years and my father left us when I was young. Mom sacrificed in more areas that I may ever know so that I could have opportunity. She reminded me constantly that I could do anything, if I put my mind to it. She passed over January 2, 2016. I say passed over, because I cannot conceive of an existence that does not live on both in this world and another; no one passes away. This too is a gift of life. Her health was excellent and we had enjoyed a New Year’s Day family gathering the day before. She passed over on the steps of her front porch the next morning, a freshly brewed cup of coffee sitting by her side. She had sat in that very spot the afternoon before and joined my brother and I in a discussion of the Transfiguration of Christ. She always enjoyed and participated these types of discussions. We would have celebrated her 90th birthday on February 13th. Life, in and of itself, is an absolute miracle gift every second of every day. Unfortunately, it is often under appreciated. My older brother (by 14 yrs) gave me the Gift of Curiosity. Apparently I sat mesmerized as a baby while he put together model planes, cars and boats. Mom says I used to tear them apart, just so I could see for myself how they went together. I continued this habit as I got older; taking apart nearly every toy mom ever bought me to see how it worked. Neither my mom, nor my brother were thrilled that I was overflowing with this type of deconstruction curiosity. I was given the Gift of Education by a vast array of talented and dedicated teachers from Kindergarten to Graduation. I’m very fortunate that most of them were demanding and refused to let me get by with mediocrity. In college, I was given the Gift of Learning by a number of professors who insisted that answers to questions were of no value, unless they could be supported with reasoning. I’m sure that I drove a few to a higher dosage of blood pressure medication. I have been given the Gift of Love by someone who understands me and accepts me as I am, without reservation. She is now my wife, my partner in the adventure of each new day, and the talent behind the layout and design of all of my books. She continues to exceed all my hopes and dreams daily. I have been given the Gift of Amazement by my Daughter who never ceases to make me proud. I have been fortunate beyond words to watch her grow up and excel. She gave birth to her first child, Conrad, on February 6th of 2016. He will become a big brother in February of 2018. My 3rd book, HELLO… Is This On? is dedicated to my daughter.